Yesterday, 31st January 2019, Future Biogas launched a landmark green energy partnership with the Ministry of Defence, signalling the UK military’s transition away from fossil fuels. 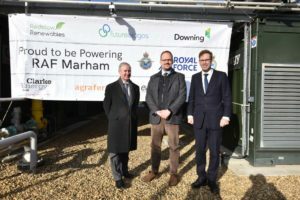 Home to the frontline squadrons of the RAF’s elite Tornado Force, RAF Marham, in Norfolk, has become the first British military base to run nearly entirely on green electricity. 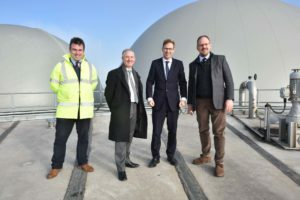 Over 95% of its electricity is now to be fuelled by the fermentation or ‘anaerobic digestion’ (AD) of locally-grown crops at Redstow Renewables, a nearby plant, built and run by Future Biogas. The landmark partnership was celebrated yesterday with a power ‘switch on’ event at Redstow Renewables, in Swaffham. The Minister for Defence People & Veterans Tobias Ellwood MP was the guest of honour. In a speech the Minister said: “We are facing global challenges in looking after what I believe is now a very, very fragile planet. We are testing its limits. It’s up to us, as custodians of Earth, to look at how we can be better at handing it to the next generation. That means looking at initiatives such as the one we’re celebrating here today. “Britain has a proud history of pioneering ways of promoting and using green energy. The armed forces obviously have an obligation to defend our shores and interests, but we must conduct those responsibilities with a wider interest in the world around us. The UK armed forces own three per cent of UK land, which is a big part of the national real estate. We need to look at how can we create energy. We need to ask: how can we operate in a more responsible way in the future? In a subsequent speech, Philipp Lukas, founder and managing director of Future Biogas, said: “Future Biogas is leading the way in the supply of green energy to the British government. We are immensely proud of this partnership with the RAF. The base at Marham is of huge strategic importance. It’s fantastic to see such a vital asset join the green revolution. “Of course, it’s not just about green energy. A major project like this provides jobs to the local economy. We have 12 skilled staff working on site at Redstow Renewables, managing the plant to the highest industry standards. “We also work in partnership with local farmers, who grow the feedstocks that fuel the plant. For them the benefits are both financial and environmental. They grow these additional crops in rotation with their usual crops. This not only provides them with a new income stream but also boosts the health of their soil, which is enriched by the variation in nutrient uptake. The Right Honourable Tobias Ellwood MP then cut the ribbon on Redstow Renewables, as its connection to RAF Marham went live. Around 60 other guests were in attendance at the launch – including top RAF commanders, local feedstock farmers and representatives of companies involved in the groundbreaking project, such as engineering specialists Clarke Energy and investment manager and project funder Downing. All guests enjoyed a guided tour of the plant. This included the chance to look inside the tanks full of harvested crops. The addition of specially-cultivated bacteria means these feedstocks break down and release gas, which is duly siphoned off. It can then be supplied directly to the National Grid as green gas or, as is the case for RAF Marham, burnt to produce electricity. The leftover organic waste from this process is then dried, separated and used as natural fertiliser to help grow more crops. Redstow Renewables generates 4.5 MW of electricity every hour, which can power 350,000 LED bulbs. Its new green energy supply to RAF Marham will result in an annual reduction of the Ministry of Defence’s emissions by 14,000 tonnes of carbon dioxide (CO2). It will also deliver around £300,000 of annual electricity savings. Future Biogas has strong ties with the military, as ten per cent of its staff are ex-forces. Its plans for this venture have been in development since February 2015. The Defence Infrastructure Organisation (DIO), the part of the Ministry of Defence that manages the Defence Estate, has collaborated with colleagues at Future Biogas, energy company EDF and Crown Commercial Services, the government’s procurement agency, to develop a green, sustainable and cost-effective electricity supply for RAF Marham. At the outset the DIO undertook a feasibility assessment, to assess the benefits that could be derived from a clean energy supply. As well as saving money and reducing carbon emissions, it was determined that connecting to the AD plant would increase power resilience at RAF Marham, by providing multiple pathways to electricity. This is the first major green innovation from the Ministry of Defence. To date, the only other military base in the UK using any form of renewable energy is MoD Lyneham, in Wiltshire, which has solar panels supplying just 20% of its power. The huge success of the RAF Marham clean energy project will hopefully mean there’ll be many more to come.